Both the gen y actors are taking the hotness levels to new heights. Casually dressed, Sharaddha is displaying some positive arrogance, while Shroff junior is flauntig his gutsy physique. 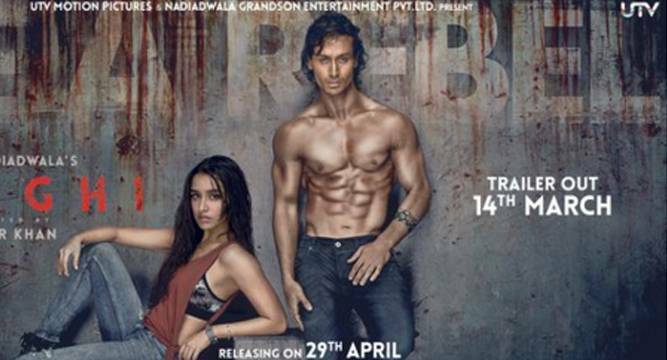 The makers of Baaghi featuring Shraddha Kapoor and Tiger Shroff have relased the first poster of the movie.Both the gen y actors are taking the hotness levels to new heights. Casually dressed, Sharaddha is displaying some positive arrogance, while Shroff junior is flauntig his gutsy physique. The two “rebels” are forming one hot pair! The makers of the film have a lot more in store for us. And hence they said, “Abhi toh humne start kiya hai!”. Baaghi” which brings on screen childhood friends, Shraddha and Tiger, is slated to release on April 29. ‘Baaghi’ is directed by Sabbir Khan and jointly produced by UTV Motion Pictures and Nadiadwala Grandson Entertainment Pvt Ltd.